The challenges of measuring social change are well known – the complexity of the process, the length of time involved, the difficulties of attribution. One key issue that has been neglected, argues guest editor David Bonbright in his introductory essay to this Alliance special feature, is who does the measuring and whose perspectives are taken into account. Another key issue is how the different systems of evaluation imposed by donors affect grantees; this is one of the main questions posed in a special online survey commissioned by Keystone and Alliance. The special feature also includes interviews with Hewlett Foundation President Paul Brest on how we get good information into the public domain and with Swedish industrialist Percy Barnevik on his use of business-style metrics in running an NGO. The feature ends with the reflections of our second guest editor, Akwasi Aidoo. The December issue of Alliance will also include Bill White on what’s missing from the climate change discussion and Barry Gaberman asking if there’s still room for charity in philanthropy. Making social investment decisions – What do we need to know? 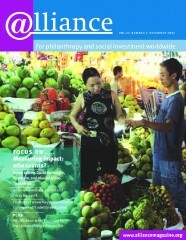 Center for Effective Philanthropy – What can we measure? The impact industry: who needs it? Anyone for a results library? Doing ourselves out of a job?